A year and a half after their last release as a group, SS501 is back with their mini-album, Rebirth. A year and a half after their last release as a group, SS501 is back with their mini-album, Rebirth. Despite plagiarism issues that led to the Korean boys having to find a new song and re-record their track while they were on their first Asian tour, they managed to churn out the album just 2 months after the initial scheduled date. Rebirth doesn’t really live up to its name since SS501 has stuck with the tried and true, and almost all 5 tracks are reminiscent of previous releases, in terms of both lyrical content and concept. 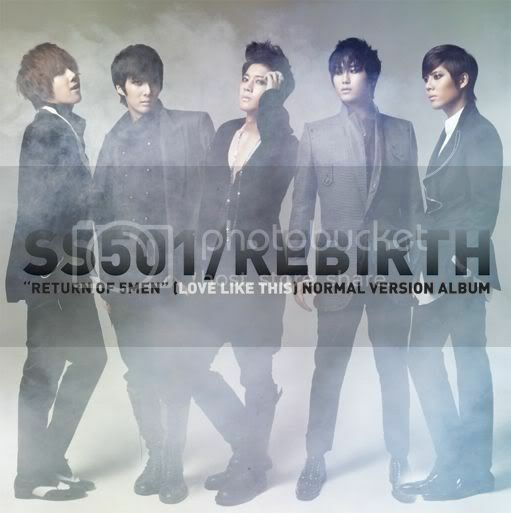 Contrary to the edgy, man-linered album images in Rebirth, the songs in the album are mostly upbeat, typical boy band fare, with dance-pop beats and romantic ballads that will make their female fans swoon. This doesn’t come as much of a surprise, as the award-winning Steven Lee, who has written songs for top Japanese idols such as Johnny’s Entertainment’s Arashi, V6 and Do As Infinity, also produced all the songs for Rebirth. Another name to boast about is Hollywood’s Ken Lewis, famous for working with Usher, Kanye West, and John Legend, who mixed the songs on the album. While the full MV is yet to be released, DSP Entertainment, the SS501’s management company, has said that a former colleague of Michael Jackson, AJ, choreographed SS501’s new dance. While the buzz created by such big names has been significant, what has excited the fans was the lyricist for the song “Obsess“—none other than SS501’s leader himself, Kim Hyun-joong. According to him, the words in the song are dedicated to SS501’s fans. “Obsess” is enjoyable, with a mellow beat and electronic undertones. it also allows the listener to appreciate the member’s voices, as it explicitly demonstrates the improvement of the boys’ vocals have undergone since their debut in 2005. However, the solid favourite will have to be “Wasteland”. It has a heavier beat than the other songs, though nothing like their previous release, “Déjà vu“. It brings across a melancholy, slow-rock feel, though essentially it’s still meant to be a dance track. Another notable number is “Love Like This”, which is also the first single of the album. So far, only the MV teaser has been released, although it has been performed live by the group on several music shows. As a contemporary-R&B-slash-dance track, it’s not what fans usually expect of SS501. Although it’s for the sake of trying “different things”, they have proven more adept at heavier songs, and UrbanWire would’ve preferred another song similar to “Déjà Vu” or “UR Man“, both of which have proven to be catchy chart toppers. Regardless, Rebirth has done well, hitting 30,000 unit sales on its first day on the market in South Korea. For those looking forward to listening to the multi-talented idols, (Hyun-joong is most well-known for his role in the Korean version of the drama, Boys Over Flowers, and Jung-min had a role in the Korean version of the musical Grease) they have yet to finish their Asia tour. Concerts in Shanghai and Hong Kong have been confirmed, and there are plans for stops in Beijing, Thailand, Malaysia and, believe it or not, Singapore. It’s Not Easy: U-Kiss Comes Back!